Rockland County Correctional Facility is a county jail facility located in New City in Rockland County, NY. 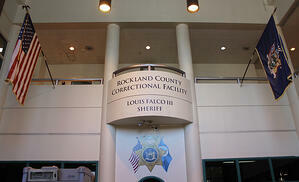 Considered a medium-sized facility with a maximum capacity of 250 inmates, the jail serves as a correctional facility for Rockland County and surrounding areas. 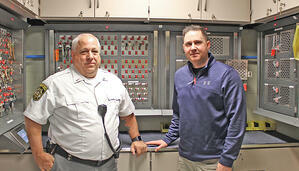 With 15 years at RCCF, Lieutenant John Hickey has a long list of responsibilities. In addition to his work as a firearms instructor, IT expert, head of K-9 operations and CPR trainer, Lieutenant Hickey oversees all of the keys in use at the facility. As a former locksmith and access control expert, he quickly identified the need to better organize, secure and track the facility keys. In addition, there were other sensitive items at the facility – including firearms, kitchen knives and various evidence – that needed to be secured. To accomplish this, Lieutenant Hickey evaluated several brands of key management systems, ultimately deciding on Morse Watchmans’ KeyWatcher, which provides both comprehensive key management along with integrated lockers to safeguard handguns and various other potentially dangerous and/or expensive devices. With the blessing of 7-year Sheriff Louis Falco, III, four KeyWatcher systems were deployed at RCCF, fulfilling a number of differing needs in different areas of the facility. Each area uses its own individual color of SmartKey fobs to secure items within the cabinet, helping to keep items organized within the system. The armory has the most extensive setup at the facility, housing over 240 keys. Facility keys are secured in one section of the KeyWatcher, with keys for areas outside the building kept together in groups. To manage and control the RCCF’s vehicles, their keys are locked in the KeyWatcher with specific policies around how they are removed. Each time a vehicle key is removed, the user must add a note within the system describing what the vehicle is being used for, along with a notation of the mileage. This helps ensure that vehicles receive regular maintenance. 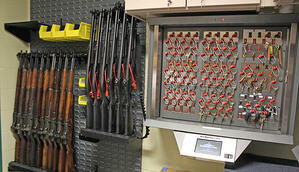 The correctional facility has numerous firearms in regular use, and they have developed a unique use of the KeyWatcher to keep these in authorized hands only. Twelve KeyWatcher lockers house Glock handguns and magazines. 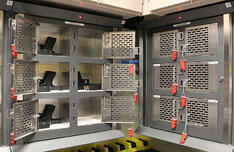 The SmartKeys for these lockers are kept chained to the lockers within the KeyWatcher cabinet. Individual weapons must be signed out, providing accountability and the ability to audit usage. Each time a weapon is removed, the users must leave a note in the system indicating how many rounds of ammunition were taken, and how many rounds of ammunition they used when the weapon is returned. Four additional lockers hold Tazers and two hold evidence; these also require a note explaining the reason for removal. Keys for the chamber locks of the 16 long guns are also kept on Key-Rings locked in the KeyWatcher. The final group of keys secured within the armory KeyWatcher are for locks other than doors or cells. These may be for drawers, toolboxes etc. In the back Sergeant’s office, 70 emergency and nursing department keys are kept in a cabinet, attached to yellow SmartKey fobs. Any time a key has gone missing, the accountability provided by the KeyWatcher has reduced or eliminated the need for a full building lockdown, according to Lieutenant Hickey. A set of keys for the kitchen is also kept in this KeyWatcher. Another unique use of a KeyWatcher can be observed in the RCCF kitchen, where blue SmartKeys are in use. 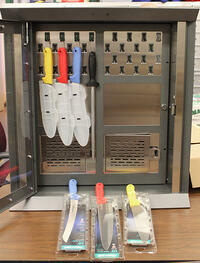 Here, kitchen utensils such as knives, large forks etc. are securely locked in the KeyWatcher cabinets. Because the use of these implement must be carefully controlled to prevent them from being used as weapons, total accountability is required. The door to this KeyWatcher cabinet is clear plexiglass rather than steel, so that personnel can see at a glance what is (and what is not) in the cabinet. The system is configured so that each item has a time limit for use, and administration is alerted by an audible alarm any time an item is overdue for return. Finally, the central control area of the facility has a KeyWatcher housing 32 keys on green SmartKeys, plus one locker for evidence. 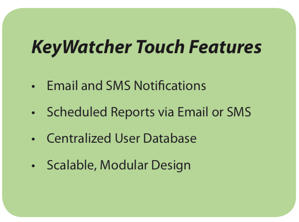 While the four systems are located in different areas of the RCCF, the KeyWatchers are networked together and share a single database. This provides management with full reporting and accountability throughout the facility. “The accountability and reporting made possible with KeyWatcher was a deciding factor in modernizing our facility,” noted Sheriff Louis Falco, III. Access to the cabinets and to each key or item stored within is limited to authorized individuals, who must present credentials including biometrics for added security. Lieutenant Hickey appreciates the flexibility to add or remove staff from the system quickly and easily. “The ability to remove their access is as important as giving them access,” he said. Among the numerous other benefits delivered by the installation of KeyWatchers, Lieutenant Hickey also notes both ad-hoc and scheduled reports, plus official timekeeping for shifts. One additional advantage over other systems is that there are no licensing fees or added costs for software updates, providing significant savings for the facility over time. Overall, deploying the KeyWatcher systems at the RCCF has increased total accountability and upgraded security for the facility.